I was inspired to create this puzzle when I realized two of our friends would be celebrating their 70th birthdays in two weeks. I wanted to make them something personal, but with the limited time frame, it had to be reasonably simple. I was reminded of the saying “70 is not old—if you’re a tree!” and started working on a design for the puzzle. I looked at lots of pictures of trees and drew the shape freehand. I often use MDF (medium density fiberboard) for my puzzles because there is no grain or plies to break off, and its smooth finish is ideal for painting. 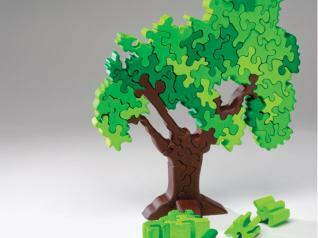 The tree puzzle can be made from plywood or naturally finished hardwoods. There are lots of ways you can personalize this pattern. 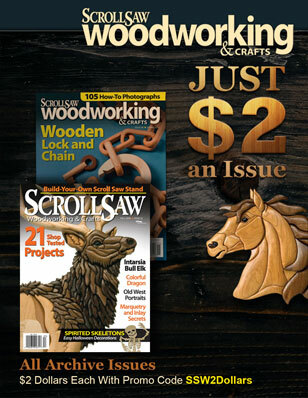 Coordinate the number of pieces with the recipient’s age or create a puzzle “just for yew”–made from yew wood. Include apple-shaped jigsaw pieces for the apple of your eye (perhaps five apples for a five-year-old) or cut acorn-shaped pieces and write “tall oaks from little acorns grow” on the back for the new graduate. Add family members’ names to individual pieces for a family tree or add significant dates and events to create your own tree of life. Step 1: Prepare the wood. Seal and sand the stock. It is easier to begin with smooth wood rather than trying to smooth the small jigsaw pieces. Attach the pattern to the wood. Step 2: Make sure the saw table is square to the blade. Use a small square. If your table is not square, it will be difficult to assemble the puzzle. Step 3: Cut the outline and open areas. Drill blade entry holes and cut the open areas. Cut the perimeter of the tree and the base piece. Step 4: Shape the edges of the tree. Round the edges with a router and round-over bit. I use a Dremel router in a router table. Do not round over the bottom edges of the tree trunk or the base piece. Seal and sand the routed edges. This step is optional, but does give the puzzle a more polished look. Step 5: Cut the puzzle pieces. 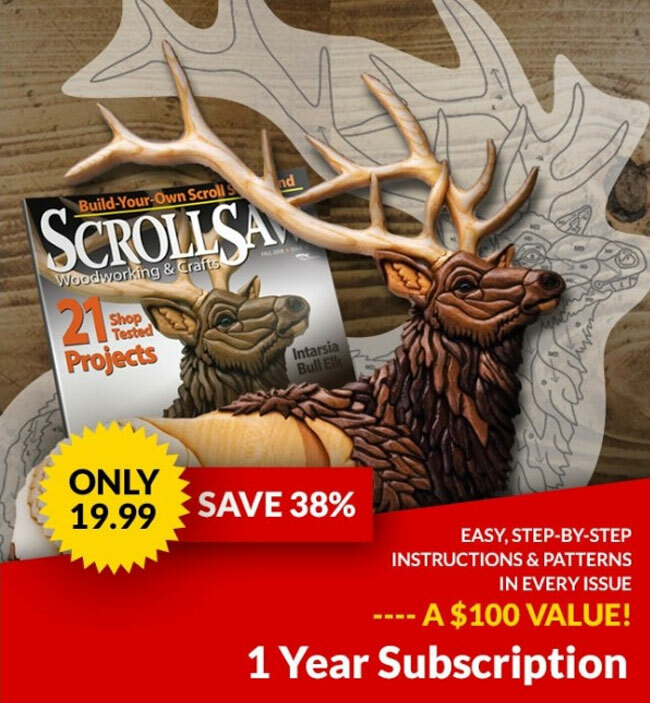 Use the pattern provided, sketch your own puzzle pieces, or cut the pieces freehand. If the puzzle is intended for a small child, cut large pieces to prevent a choking hazard. The green lines on the pattern are deliberately thick. Use them as guidelines to make smooth flowing cuts. Once the pattern has been removed, variations won’t be noticeable. Advanced scrollers can follow the traditional fine lines in the center of the green pattern lines. Adjust the slot in the base to match the thickness of the wood. Step 6: Prepare the puzzle for the paint. Remove the pattern. Seal and sand all of the edges. Assemble the puzzle and sand both sides with a sanding block. Step 7: Paint the puzzle. Separate the trunk and base pieces and paint them brown. Do not paint the inside slot of the base. Divide the leaf pieces into three or four piles and paint the pieces in each pile a different shade of green to ensure a random distribution of color. Step 8: Finish the puzzle. Allow the paint to dry. 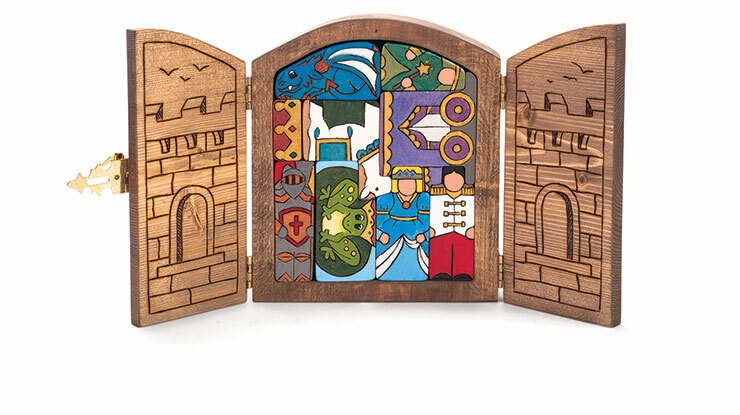 Assemble the puzzle, stand it up on its base, and spray with matte varnish. Sign or label your project on the bottom of the base piece. I create a label including a photograph of the assembled puzzle to aid the recipient and attach the label to the front of a box. I’ve also created laminated labels to attach to drawstring bags. CLICK HERE to download the Tree Puzzle Pattern.